A glamorous evening awaits you at Soiree in the Spotlight. Walk the red carpet to begin your evening with cocktails and hors d’oeuvres in the Halloran Centre. 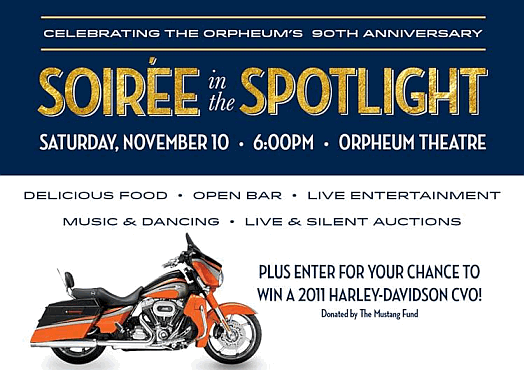 The party continues in the Orpheum where you’ll enjoy delicious food and an open bar, bid on hundreds of items in our live and silent auctions, and dance the night away on the Orpheum stage thanks to live music and entertainment, all while supporting a great cause! Our silent auction will once again feature convenient bidding on your mobile phone. Cocktail attire suggested. Purchase individual tickets online below. To purchase tickets by phone or to learn more about reserving a VIP table call Shasta Blue at (901) 529-4230. Purchased tickets will be mailed following your order.